Gina and I planned to go to the recent Inauguration, and we’d secured tickets through our Congressman’s office. But jury duty supervened. So we canceled our reservations and gave the tickets to our older son James, who lives in the DC suburb of Falls Church. It turns out that our tickets permitted access to an area pretty close to the inaugural event, in a small traffic circle that contains one of James’s favorite Washington features, the little-known and under-appreciated “Peace Monument”, also known by the moniker cited in my title, above. The monument was erected in 1877-78 to memorialize Union naval deaths at sea during the Civil War. Sculpted by Maine native Franklin Simmons – a well-known portrait sculptor of the time – it stands, at 44 feet, in Peace Circle at Pennsylvania Avenue and 1st Street NW. The top figures depict America (or Grief) holding her covered face against the shoulder of History, weeping in mourning. History holds a tablet inscribed, “They died that their country might live.” The major figures standing below are Victory – facing west – with an infant Mars, god of war, and an infant Neptune, god of the sea, lounging at her feet. Facing the capitol stands Peace, with symbols of peace and industry, science, literature and art resting at her feet. The monument’s inscription reads, “In memory of the officers, seamen and marines of the United States Navy who fell in defense of the Union and liberty of their country, 1861-1865.” Admiral David D Porter, Civil War commander of gunboat fleets, conceived the monument and raised the necessary funds from private donors. 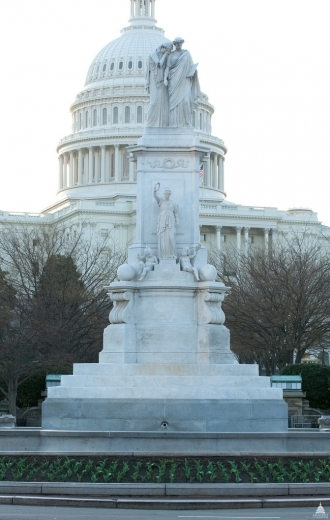 The monument came under the cognizance of the Architect of the Capitol in 1973. Badly weathered and damaged after 100 years of neglect, it has since undergone three major restoration / preservation efforts, in 1990-1991, 1999 and 2010. Interestingly, several limbs of the statue’s figures were broken off when crowds climbed on them during the 2009 inauguration. My source of information is the Architect of the Capitol website, http://aoc.gov/capitol-grounds/peace-monument, accessed 31 January 2013. Your correspondent is serving jury duty (a murder case – could run a month), and accordingly, has not been able to do his usual research to write. Fortunately, this week, Professor Timothy Walker sent me notice if the book review below with the note “this might be of interest to members of your Society [of the history of Navy Medicine]”. I suspect it will be of interest to readers of this blog, too. Thanks to the kind Professor! As you can see, the review comes to us by way of the h-net list serv from MSU. by the number of publications in the field within the past decade. Tropical Diseases at the end of the Victorian era. slaves, convicts, and indentured or poor migrants. professional expertise of the naval surgeons of the French Wars. apprenticeship as well as university and teaching hospital study. for their advancement of nineteenth-century science and letters. author’s view, was often inadequate experience or haphazard training. assistants, no matter how sophisticated his casualty triage system. limb amputations under extremely difficult conditions. board’s own ultimate demise when it was abruptly abolished in 1805.
awareness on the plight of sailors and brought about a turning point. that gastrointestinal diseases caused over 40 percent of such deaths. Africa, remained unchanged over the same period of study. emigrants from Britain to Australia in the nineteenth century. the much shorter, but unregulated, transatlantic crossings. Archer, Sally, eds., _Health and Medicine at Sea, 1700-1900_. H-Disability, H-Net Reviews. January, 2013. Today, I welcome a guest blogger, retired navy Chaplain David A Thompson. He is researching the 1918 Influenza epidemic. Since starting this research, I have had a lot of living relatives of WW I vets come out of the woodwork to tell their stories of their loved one’s death or survival of the flu in the military in 1918: One 85 year old woman shared with me her dad served with my dad at Camp Dodge…and was, as a admin NCO [administrative non-commissioned officer, ed. ], directed to order over 700 coffins for the dead and had to help contact families of dead and dying soldiers. Another clergy friend shared his mother’s dad died of the flu in the Army, meanwhile at home his mother lost her mother, three brothers and a sister to the flu …and was orphaned…all in two weeks in the Fall of 1918! Another Army chaplain friend shared how his dad was with fledgling Army Air Corps in France and was tasked by the CO [commanding officer, ed.] in ministering to dying soldiers due to the flu and ghost writing letters of condolences to families for the CO in lieu of lack of a chaplain. All these children/grandchildren of WW I vets, are now in their later 60”s-80’s like me (I’m a young 66). It was a terrible time for deployed soldiers and sailors, as well as those in training camps in the US, who were filled with anxiety and concern for family and friends back home who were ill with the flu (25.8 % of the civilian populations) and thousands (675,000) dying back home. Since there were no ‘footprints” in VA hospitals of wounded warriors from this terrible flu epidemic in WW I (you either got well in 6 weeks or you were very quickly dead), only mute testimony of these flu deaths related to the military (as well as civilian population) is found in US civilian cemeteries or ABMC military cemeteries in France and England (see: http://www.abmc.gov/cemeteries/cemeteries/su.php ) and Brookwood American Cemetery, 35 miles southwest of London, England (see:http://www.abmc.gov/cemeteries/cemeteries/bk.php ). The Meuse Argonne American Cemetery (see: http://www.abmc.gov/cemeteries/cemeteries/ma.php ) located 150 miles northeast of Paris, France with 14,000 graves, also has many flu casualties buried there. It was during the Meuse Argonne Campaign when the pandemic hit the AEF in full force in October-November 1918 during this battle (over 20,000 + AEF troops died of the flu in this 6 week period of this campaign), while 30,000 died in CONUS [Continental United States, ed.]. Military flu casualties in the US were buried in VA or thousands of community cemeteries in the US, like the one in Texas noted here (see website: “WW I Casualties from Fayette County” from a county in Texas that documented so many flu victims among WW I veterans in its county cemeteries http://www.fayettecountyhistory.org/deceased_WWI_veterans.htm ). Most CONUS Navy flu casuloaties were buried in this matter…bodies shipped home by train for quick 15 minute graveside services with only immediate family and clergy without military honors, due to quarantine. In discussing the WW I Centennial Commemoration of WW I with the American Legion National HQ, there may be an interest in mobilizing American Legion Posts in every county across our nation to dig into county WW I records (like they did in Fayette County, TX) to find veterans who died in the Great War due to combat or to the flu and tell their story during the WW I Centennial Commemoration in 2018. Such an excavation of WW I veteran records with photos and cause of death will bring to life for the public the sacrifices of WW I veterans and the impact upon our forces of the Great Flu Pandemic of 1918.